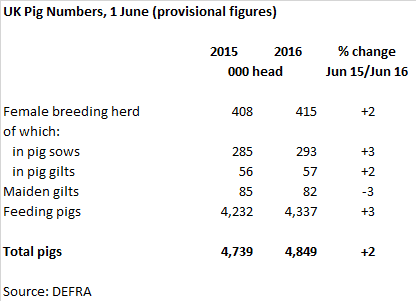 UK - Provisional Defra figures for the UK pig herd as at 1 June 2016 indicate a 2 per cent increase in total pig numbers, relative to the same point last year. This increase was largely driven by a 3 per cent increase in feeding pig numbers, likely following from expansion in the breeding herd at the end of 2015, particularly in Northern Ireland. The Defra figures also indicate a somewhat unexpected 2 per cent increase in the UK breeding herd, with both in-pig sows and in-pig gilts up, by 3 per cent and 2 per cent respectively. Poor pig prices during the first half of 2016 led to anecdotal reports that many producers were scaling back their breeding herds at this time. Equally, sow feed production was back 3 per cent on 2015 between January and June this year, which could suggest the number of breeding pigs to feed was in fact down. Hence the current data should be viewed with caution. However, maiden gilts did show a decline in numbers of 3 per cent, which would potentially indicate there was a low desire to replace culled sows in the first half of this year. As the Scottish census results will not be published until later this month, these provisional figures are only able to take into account trends from England and Northern Ireland. Welsh figures are also not available until later this year, though due to the small size of the Welsh pig herd these results are unlikely to impact the overall trends. Final UK figures will be published in December.